At What Price, For What Time? Fossil fuels, the carbon demons of the modern world, seem to have got us by the short and curlies! How much is this true and what is the outlook for the world with and without them? Certainly the price of gasoline has got people's attention. Is this just a current blip, or are we going to have to live with this or worse? Is peak oil already upon us? The name for fossil fuels exposes its origins. These are products from millions of years ago, like all fossils, that we have reaped the benefits of in running our modern world. Essentially they come from two sources, land and water-based. Coal and its associated methane gas arose from buried plant material from huge forests and swamps of the carboniferous period. Petroleum products, including natural gas, were created from water-based algal organisms becoming buried and compressed. Being created over millions of years while we consume them at massive rates we will deplete them eventually. There is great debate over the time this will take. Dire predictions from the 1960s of the earth running out of oil have not been fulfilled exactly as stated. New deposits, new technologies, and more efficient use of oil products have all contributed to this. Coal has been used from pre-history. It was important in the production of metals. It drove the industrial revolution and powered the steam engine. Petroleum products were used from ancient time more for water-proofing properties. The rise of the internal combustion engine required oil products, initially diesel type and then more refined gasoline. Even today most transportation modes require oil-derived products to continue. There are some changes on the horizon with more renewable products like ethanol from starches and more recently tougher plant parts and the rise of petroleum-like derivatives directly from processing plant products and by-products. Throughout the world fossil fuels still provide the majority of the world's energy needs, whether in transportation or electricity production. Burning of fossil fuels has created the major global warming concerns with its production of greenhouse gases. It is estimated in carbon dioxide alone 21.3 billion tonnes a year is being produced world-wide - twice what is calculated as being able to be naturally processed by the earth. The energy for the rising Chinese economy is 70% fueled by coal-fired power stations, creating national problems with air quality. 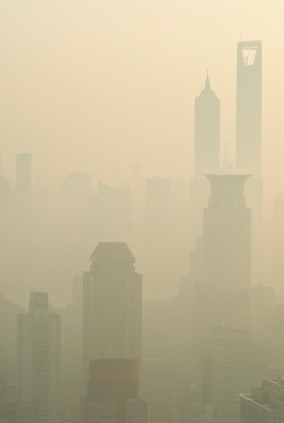 In 2007 it passed the USA as the world's top carbon polluter and now belches out more than the USA & India combined. It is using as much coal as all the rest of the world's other nations put together. Interesting in fossil fuel developments is the work of a couple of Chinese graduates from the USA who have returned to their home country. Now based in Shanghai they have developed a catalyst which converts methanol from coal to form dimethyl carbonate. Dimethyl carbonate creates more oxygen in the burning of heavily-used diesel fuel. This reduces the sooty carbon component of diesel exhaust by over ninety percent. China is embracing a number of clean coal technological innovations such as underground coal gassification. It is also employing carbon sequestration pumping liquid carbon dioxide underground. However the volumes sequestered this way are still low compared to the amount produced. China's active pursuit of alternative energy technologies is well known. Huge efforts are being made to rapidly expand technologies aside from fossil fuels based ones. Electric Vehicles - So Clean? As part of this they are seeking to use more electric cars. Of relevance, not just to them but also to the rest of the world, is the galling statistic that electric cars effectively pollute the environment more than gasoline-powered versions. Due to China's heavy reliance on fossil fuels for power production fine particulate emissions per passenger unit distance travelled are 3.6 times higher for electric cars than for gasoline powered ones. This is better than the figures for diesel-powered cars, although diesel buses, with their multiple passengers, are about equivalent. There are methods available for dealing with particulate emissions from burning of fossil fuels especially coal. Most countries have strong emissions guidelines requiring these to be employed. Fine ash is trapped by filters or electrostatically. Although this waste can be dumped there are quite a number of uses for it including very energy-efficient-in-production, strong and effectively insulating bricks. The world's deposits of coal could supply even current demands for a few hundred years. For most of the world the fossil fuels we are most concerned about are the petroleum-based ones. Unlike most of the world, the USA has benefitted from profoundly lowered natural gas prices due to its current huge production. The processes for extracting this has produced wide-ranging debate about the environmental effects. More on this later. Why are gasoline prices remaining so obstinately high? Many feel we are at the peak oil time, where supply is just keeping up with demand. When events such as Libya's recent political upheavals affected its ability to supply its oil to the world, prices spiked. Even as it comes back on-line the chances are the prices are going to remain elevated. Several countries like Russia, Iran and Kuwait have peaked in their oil production. Saudi Arabia, with the world's largest deposits, still has the ability to adjust its production to fit demand. Elsewhere the search for oil is occurring in areas from where it is much more difficult and costly to extract. Whether this is from large offshore fields like the newer one 180 miles (300 kilometres) off the coast from Rio de Janiero, deeper-lying Gulf of Mexico ones, or oil shales and oil sands in North America, both production, adjustments and responses to accidents or other incidences will involve longer time frames than simple land-based liquid petroleum pumping. Brazil's new field in 7000 feet of seawater and then under 5000 feet of rock is deeply seated. 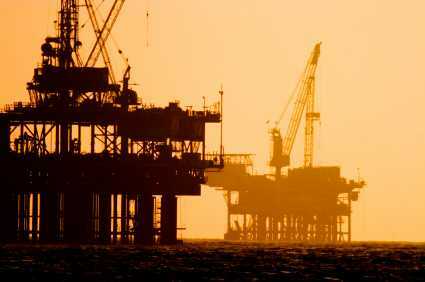 Estimated to be 100 billion barrels with one platform pumping at 68,000 barrels a day, this is a significant new supply. When you consider, though, that the world's petroleum use of fossil fuels runs at over 82 million barrels a day, with around a fifth of this consumed by the USA, it is a relative drop in the bucket. To become energy self sufficient the USA is exploiting its less readily accessible petroleum deposits. In North Dakato oil shale extraction is creating thousands of new jobs and new petroleum supply. With the current price for petroleum the extra costs of extraction make it economic. Utilising the same methods as those employed in natural gas extraction with vertical drilling to the shale layer, then horizontal drilling and fracturing, it is proving effective. How much these methods affect the environment is actively debated. The movie Gasland documenting multiple state environmental effects from fracking disturbed many. Television coverage concentrated more on the visually dramatic effects of gas tracking into water supplies. Flames could be lit from taps! However it is the other effects that are more disturbing. Fracking does use enormous amounts of water, pumped into the ground along with a number of proprietary chemicals. A percentage of this water is retrieved and then has to be disposed of. Disposal systems, especially with the volumes that need to be handled, do not seem to be ideal. Other chemicals used in the fracking fluids are being detected in aquifers. When these include ethylene glycol and other heavy metals, serious questions need to be raised about the future health of the surrounding population. In a state as thinly populated as North Dakota this may not spark much interest. But when the process begins to be employed in Ohio and California there may well be some more serious opposition. Again to attain energy self-sufficiency the huge reserves contained in the oil sands of Alberta, Canada are beginning to be exploited. Once more the relatively high cost of petroleum makes this financially viable. It is environmental questions like the methods of extraction, whether open-cast or more underground, and then the transportation of the products to the USA in a huge pipeline that have raised major questions. It amply illustates, along with BP's recent Gulf of Mexico disaster, the essential problem with these more difficult-to-extract petroleum fossil fuels. They are environmentally dirtier to produce. How much are we willing to pay? This is the essential question. 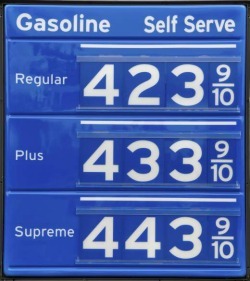 It also illustrates why gasoline prices are unlikely to fall as they have in the past. We are seeking to extract more and more and difficult sources. They are costlier and environmentally more challenging to exploit. We may well have to live with prices like we have now or even higher. Even more important than that though is for how many years these supplies are going to last. Given our current consumption, let alone the rapidly rising demands in the hugely populous countries of China and India, we are looking at a couple of decades or so. Fossil fuels have been a mainstay of the rise of the modern world. To continue we are going to have to agressively, in time and money, pursue alternative energy sources that will lead us into the future.